My name is wrong on my Gmail account only when I type my name on the search box. The problem is because someone sent me an e-mail with "Roberto Hermano ". 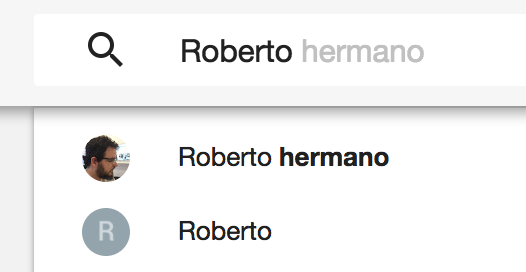 This way this name "Roberto Hermano" now appears on search results and when I enter on chat messages it also shows me as "Roberto Hermano". I already triple checked Google Accounts name and also Gmail Settings, both correct with my name "Roberto Marin" not "Roberto Hermano". I've already deleted the wrong spelled messages, but anyway it keeps showing me "Roberto Hermano", this is very annoying. Any ideas? Why is Gmail showing the wrong date/time for my messages? How to set up Gmail to show more than 20 results per page when searching?